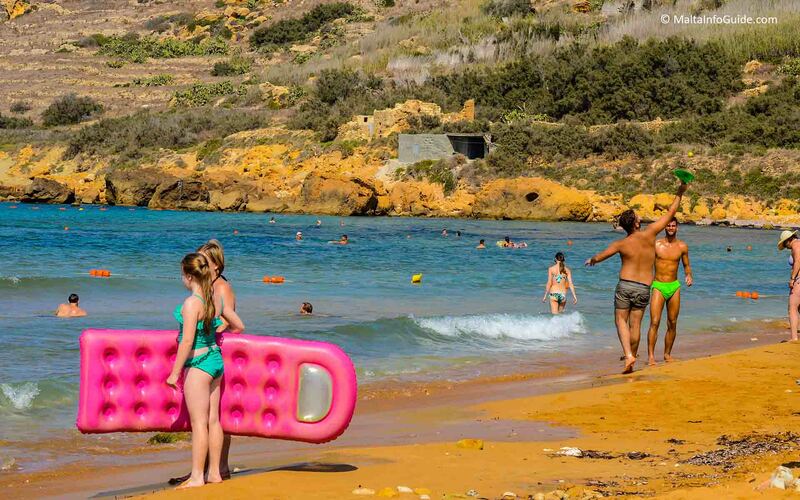 Ramla l-Hamra bay photos very attractive for the eye due to the sand colour and surround natural features. 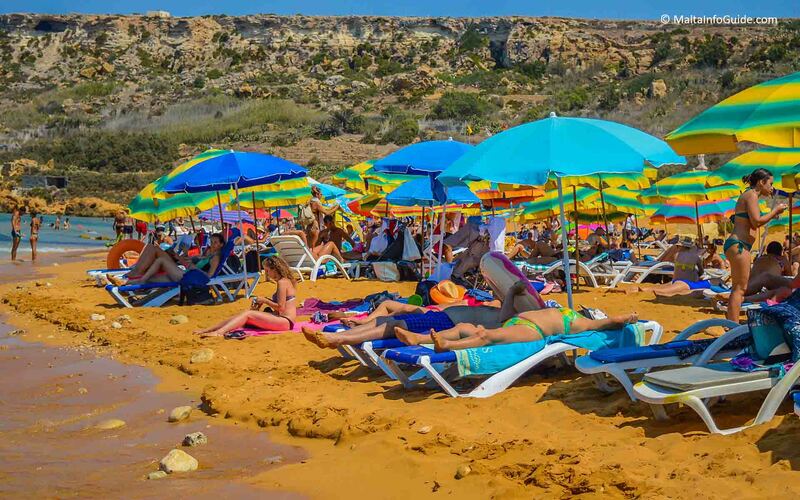 It is the biggest sandy beach in Gozo where it is without saying very well visited. It is admired by the beauty of its colourful sand that mingles with the beauty of the valley side hills and greenery. The valley leading to the bay is the most fertile in Gozo and although in summer there is rarely any rain you will still see substantial greenery along the lower part of the valley. In winter the bay is surely empty. You will only see random people walking along the beach. Since the sandy beach is at the end of a lengthy valley there will be evident of a small narrow stream of rain water at the centre of the sandy beach. The greenery will be in full where we recommend a visit especially for a walk to appreciate the beauty of nature. This valley is very rich in fauna and in fact it is taken care of by the Gaia Foundation which monitors the natural habitat of this valley. Apart from this they provide the lifeguard service and an information centre. Another way how to see this bay is from the top of the hill besides the well known Calypso Cave where there is a vintage scenic view point. An ideal location to take memory photos. Various remnants of fortifications still exist although they are all burried under the sand for preservation. They were mainly built by the Knights of St John as a deterrent to attackers. A bit further out in the sea there is a limestone wall along the beach parallel to the beach to stop boats from reaching the bay. There are fugal and wall defences hidden under the sand including remains of a Roman villa. Information board as soon as you arrive at the beach. 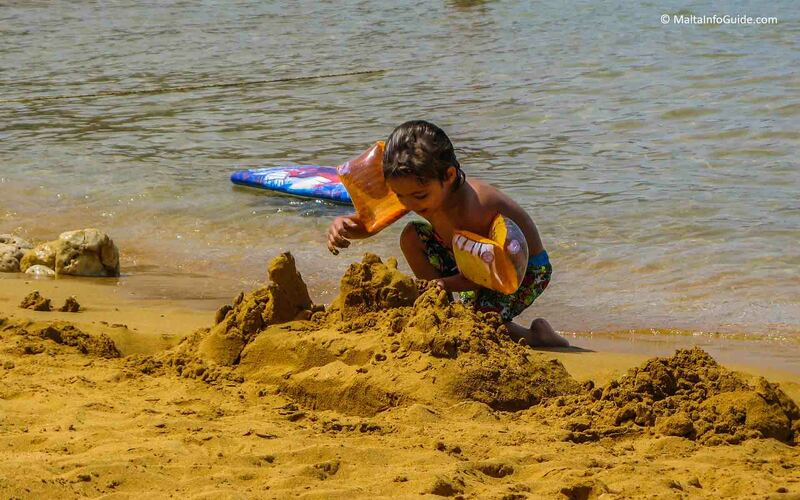 You find the facilities services, code of conduct, swimming zones, beach safety flag notifications and protected ecological and historical features. During the year 1881 a statue of the Holy Mary was built on the site of the redoubt which was part of the fortifications built by the Knights of St. John. It is standing on a limestone pillar painted in white. It is a testimony of the Gozitans faith towards the Holy Mary. At the bay you find Il-Kcina tar-Ramla Gozo restaurant and the Rose bar and restaurant. Information centre run by the Gaia Foundation.